Publishing information about yourself to selected audiences. Reflecting on your practice and performance. Assessment by aggregating and coordinating evidence. Transition, allowing you to take your evidence and thoughts with you. I’d built a basic e-portfolio system whilst at college, but the real stumbling block had always been getting accurate performance criteria into the system without months of typing. 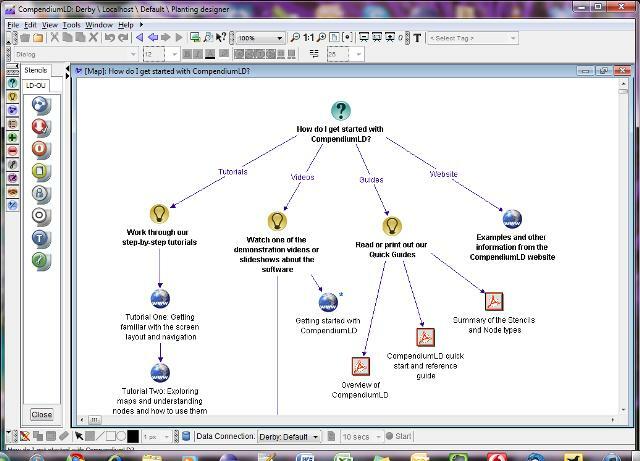 Later at Becta I was involved with the creation of a usage model for e-portfolios to support apprenticeships, which were all the rage with the Government of the time. Having taught , assessed and verified the NVQ and keyskills components of the frameworks I was very keen that the benefits of e-portfolios be spread to an area operating on very tight timelines and wafer thin margins. Some useful outputs were created, and are available from the Becta site till March 2011. I’ve also tried to attach the doc to see how posterous handles such a big document. I have more documents and will dig them out for a future posting. The University of Wolverhampton have used e-portfolios in taught programmes and to support learners on work placements. Their use is at the other end of the e-portfolio continuum focussing on Reflective capabilities. Their interactive demonstration in the Online Conference Have a Go area will explain the key aspects of the pedagogy that underpins their initiative through a narrated Captivate video and an accessible demonstration webfolio. The Conference runs from the 23rd – 26th November 2010, BUT the pre-conference activity and reading week opens on 16th November 2010 and offers a chance to become familiar with the conference environment and try out innovative JISC projects in the ‘have-a-go’ area. Thought I’d test what posterous does with attached word documents. This is the FAQ compiled from the Elluminate session we ran the other day to support bidders for the Learning and Teaching innovation Grant for FE in Scotland, Wales and Northern Ireland. For the exclusive few in the pre-conference activity and reading week, Lisa Vincent of Netskills is giving a guided tour of “Elluminate” moderator functions. I’m selling it short with such a cumbersome description. I’ve had the good fortune to have benefitted from one of these sessions, and can vouch for the great value of being shown how things work by Lisa. JISC have been using Elluminate to support projects like the recent OER call, and one of the great benefits is the way the session is recorded, retaining all the interactive elements, links etc, rather than just being a video file. Elluminate has been bought by Blackboard/Wimba so it should become more integrated for those who use those services, and will likely maintain its hefty price tag. Elluminate is not the only online conferencing tool available, so for those who prefer a more open approach it may be worth looking at some of the alternatives, like big blue button, which has a fairly active open source development community behind it. The various types and capabilities of these tools was recently reviewed by Stephanie Warren at New College Swindon as part of a Becta TEN project. 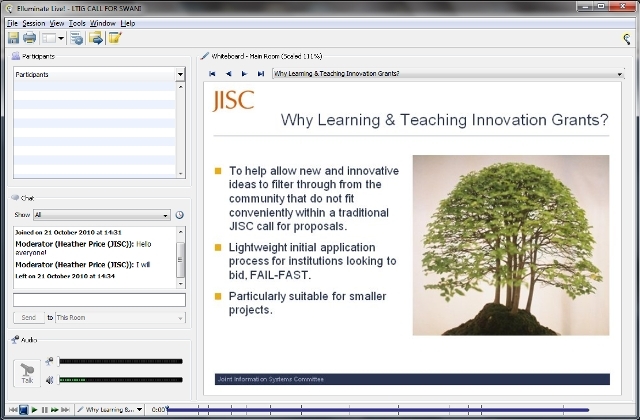 Last week at the JISC expert teaching group meeting I had the pleasure of chairing a session by Dr Virendra Mistry, of the Glamorgan Clinical Simulation centre who talked about his experiences running a Learning and Teaching Innovation grant project, SCALE. -Projects use IT to directly benefit learning or the learning process, not just innovative to the bidding department or institution, but can also be considered to be innovative within the wider JISC community. The project found a match to an idea that would help solve a problem they had in an area currently taught with mannequins. These mannequins are rather special and can simulate a variety of conditions, but they are very expensive, and can only be used by 5 students at a time. The project created 4 videos that showed respiratory problems, cardiological problems, neurological problems and shock treatments. 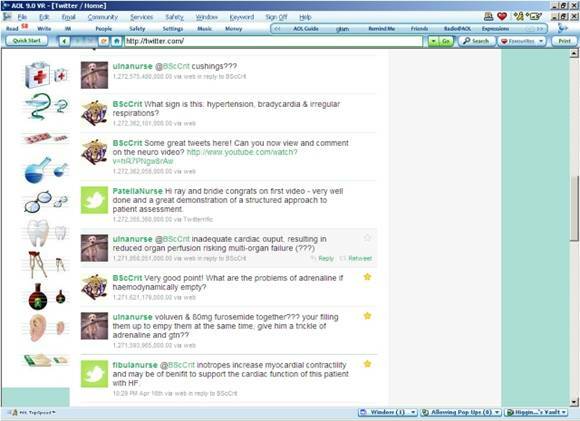 Then used twitter in synchronous and asynchronous situations to support learning around patient assessment. The series of ‘tweets’ highlighted the deterioration or improvement in a patient’s condition, and learners had to tweet back appropriate courses of action, based on the evolving symptoms. The flow of responses were then reviewed and discussed to identify whether correct diagnoses were made, and whether learning had taken place. Or by searching twitter using the #scaleproject hashtag, or looking for @iStanGlamorgan . The project Final report is due in November. Way back when dinosaurs roamed the earth and I was pleased to have access to a PC that ran at 33MHz, I was trained in the ways of e-learning by two fine fellows who were working on the ILT Champions Programme. One was Geoff Minshull, who is running the conference, the other was Alistair McNaught. About twenty of us worked through a vast range of resources to support e-learning over two days at Eastleigh College. I’m still in touch with a great number of those people, and Alistair holds a place of honour in my pantheon of ILT heroes. 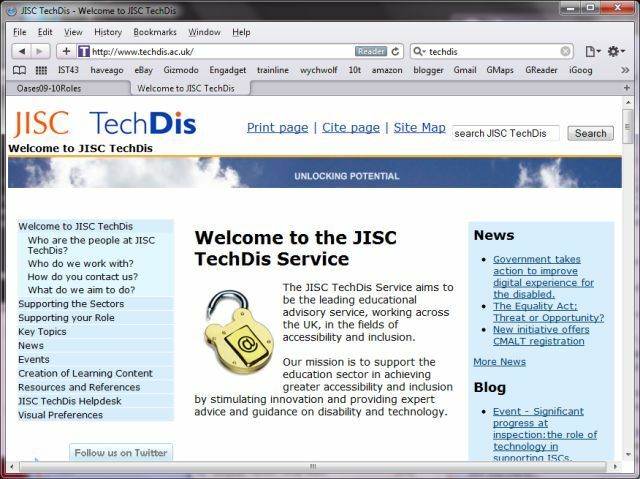 For a number of years now he’s been working away at TECHDIS the JISC advance service that advises on accessibility. In the Online Conference “Have a Go” area, Alistair has posted a link to a video introducing the Techdis Online Accessibility Self Evaluation Service (OASES). The OASES resources are a very useful tool, making accessibility relevant to the roles of those involved in education. The Equality act came into force very recently, and provides an opportunity for reflection on current practice. This resource could support a most timely intervention. I’m beginning to feel a little like Dave Gorman and his Googlewhack adventure, as each of the “Have a Go” sideshows links seamlessly to the next. 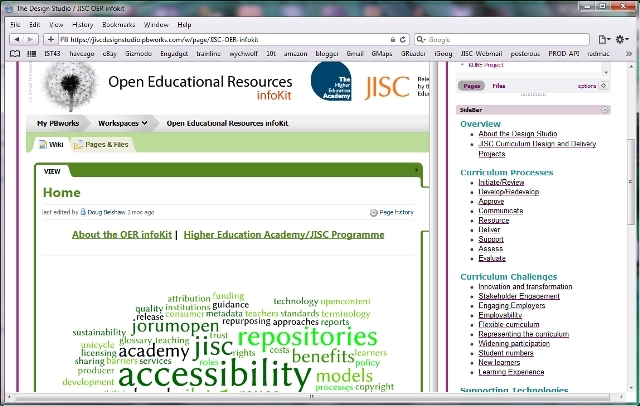 So yesterday I looked at the JISC Design Studio, where I found a listing for the JISC OER Infokit. Doug Belshaw kindly recorded an Audioboo sound bite which neatly introduces the Infokit submission to the Conference “Have a Go” area. The Open Educational Resources (OER) infoKit is based on PBwiki like the Design Studio. It explains what Open Educational resources are, and has links to advice and guidance on many aspects of OER’s including Intellectual property, which is particularly important in light of the Digital Economy act. OER’s may also become more important in light of the recent Government CSR, as they provide a route to share resources and build communities of practice. Yesterday I looked at CompendiumLD, one of the items in the Have a Go area of the Online Conference. Following that same train of thought, around the processes relating to Curriculum design and delivery, I thought it worthwhile to examine the Design Studio, another attraction in the “Have a Go” sideshow. The Have a Go area has a recorded Elluminate tour of the Design Studio, given by Helen Beetham and Marianne Sheppard, giving an overview of the development and current direction. The Design Studio itself is a wiki based toolkit, gathering resources related to technology supported curriculum design and delivery. The tool is structured around the lifecycle of curriculum design, which will mean different things to those in FE than those in HE. However everything is tagged, so locating useful assets is easy. Resources aren’t stored in the wiki, but referenced and linked from it. I browsed the Assets, and found a link to a project I was involved with at Becta: The Accessibility Passport generator. The idea was to help identify how accessible resources are,and provide guidance on how to improve their accessibility. I think the work around IMS Access for All 3 has great potential in this area, especially with the popularity of linked data.. but I digress. The way the Design Studio aggregates useful resources reminded me of the early days of FERL, lots of fascinating things which compete for attention. Browsing further I came across details of the JISC Infokit on OER, which is also on show in the JISC Online Conference Have a Go area. I’ll have a look at that in more detail tomorrow. The Conference runs from the 23rd – 26th November 2010, BUT the pre-conference activity and reading week opens on 16th November 2010 and offers a chance to become familiar with the conference environment and try out innovative JISC projects like Design Studio in the ‘have-a-go’area. See you there! I’ve been looking around the Online Conference, and it feels a bit like walking around the BETT show before the doors open. There are 18 “exhibits” (not sure that’s the right term for such interactive things) in the Have a Go area, which is a huge number, and they are all absolutely fascinating. One that intrigued me is CompendiumLD, a Java app that supports Learning Design. I’ve been aware of IMS LD as a standard since about 2004, and I’d toyed with the RELOAD LD tool, but I wasn’t really convinced it was something I’d use as a lecturer. CompendiumLD seems to go a long way to making the whole process usable, by providing a graphical interface in the style of a mindmapping tool. So I had another bash with Xerte and built a little LO on OR Gates. I like to compare the outputs of content creation tools with the Reference model of NLN Materials… 10 years ago we made some useful resources, and I used the NLN logic gate objects many times as an introduction before a practical with agricultural engineering students. What’s interesting is that with a handful of assets I can accomplish in half an hour what the NLN programme probably took months to complete to “GOLD” release. Sadly some of the old assets don’t work these days, there are a couple of flash objects which are just too old, however I happen to know they can be transcoded and saved in a more up to date version, having used some of them in my work with the Interactive Whiteboard Common File Format. Maybe I’ll revisit this LO and fix it some time.Xerte Online Toolkits really is a rather powerful set of tools, and I’ve only touched on some of the more obvious templates. Xerte Online toolkits are just one of the items in the Have a Go area of the Online conference. The Conference runs from the 23rd – 26th November 2010, BUT the pre-conference activity and reading week opens on 16th November 2010 and offers a chance to become familiar with the conference environment and try out innovative JISC projects in the ‘have-a-go’ area.